Chef Robert Sisca comes to Boston by way of New York. A graduate of Johnson & Wales, he worked his way through New England and around the East Coast. His professional travels include stints at Gracie’s in Providence and Bosun’s Bistro in Nantucket. Next he headed to his native New York, first at One if By Land, Two if By Sea and then on to Le Bernardin under renowned chef Eric Ripert. As Executive Sous Chef at Le Bernadin, Sisca was a key member of the team for four years. The restaurant, which earned the coveted Michelin Three Star award and four stars from the New York Times, was instrumental in helping him develop a keen appreciation for seasonality and quality. After traveling all over Provence, painstakingly researching recipes and dishes (often eating two lunches and two dinners a day), Sisca opened Bistro du Midi at The Heritage On The Garden in December of 2009. 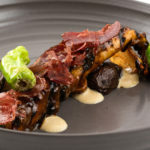 Bringing this focus on quality to his post, he created a menu of authentic ingredient-driven Provençal-style cuisine complemented by tradition and technique.